In today’s world of high speed communications, there are two common ways of getting your messages across quickly; via SMS or Short Messaging Service, and IM or Instant Messaging. The main difference between the two is where they are more commonly used. SMS is a feature that was developed for cellular phones as an alternative to calling. With SMS you can leave short messages even if the person does not answer his phone. IM, on the other hand, was developed and is still predominantly used in personal computers; thus IMs utilize the internet for passing its messages. One of the major limitations of SMS is that it was created with a 160 character limitation for each message. To circumvent this, people came up with creative ways of shortening their messages by creating acronyms and abbreviations by removing vowels. IMs do not have the same limitation but people still shorten their messages just for speed of typing. Although SMS was created as an add-on feature and was initially free, its popularity especially with young people has prompted many telecoms to charge for the service. 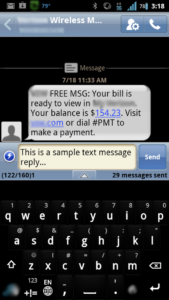 Some companies provide limited SMS in their plans while others have unlimited access. IMs are generally free, as long as you have a connection to the internet. You will not be charged an additional fee by your ISP for sending or receiving IMs. SMS is often limited to a certain country. Although many telecoms provide a way to send SMS abroad, these often cost a lot more than SMS sent to someone within the same country. With IMs, there are no real borders between countries as the internet spans the globe. The only limiting factor to IMs is the application that you are using. Different applications like GChat, YM, and Skype are often not compatible with each other; so people on YM cannot send IMs to people on Skype and vice versa. You need to be using the same applications so that you can send IMs to each other. Ben Joan. "Difference Between SMS and IM." DifferenceBetween.net. February 6, 2018 < http://www.differencebetween.net/technology/communication-technology/difference-between-sms-and-im/ >.